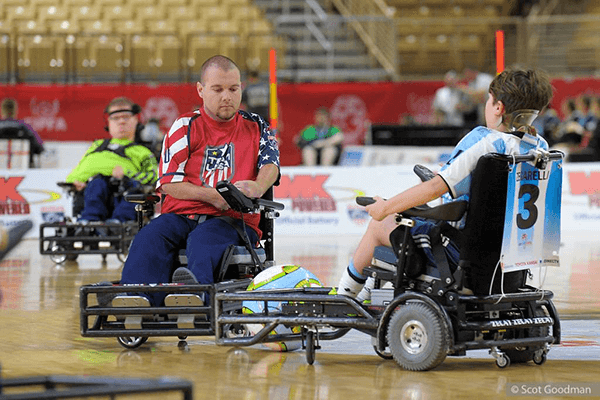 The 2017 FIPFA World Cup in Kissimmee, FL was a world class competition with thrilling play, heart-rending controversy, and great sportsmanship! 10 countries qualified for the competition and the big target was on TEAM USA, who was going for an unprecedented 3rd consecutive championship. Captained by 3 time USA team member, Michael Archer and 2 time USA team member, Jordan Dickey, the USA steamrolled through Pool A and finished 4-0, giving up only 1 goal. In Pool B France and England dominated the competition and France finished on top of Pool A by virtue of their 2-1 win over England. In the semi-finals, France made quick work of Australia while the USA edged England (2-1). This game featured a big controversy over a disallowed England goal which would have tied the game late. The call held up and the finals matchup was USA v France (as it was in World Cup #1 in Tokyo in 2007 which the USA won on sudden death kicks-from-the-mark). In the final, the USA came out strong and just missed scoring in the first minute. The French were on their heels throughout the opening 5 minutes but weathered the relentless USA attack and started putting pressure on the USA. That pressure created a French scoring opportunity about 1/2 way through the first half and the French capitalized to take a 1-0 lead. The USA came back on a penalty kick and a set play and went up 2-1, but France got to 2-2 on a brilliant counter-attack. The half ended 2-2. In the 2nd half the play was end to end but France dominated possession and neutralized the USA’s potent passing game. A late score by the French put them up 3-2 but did not end the drama as the USA pressed the attack. However, the French were equal to the defensive challenge and scored another goal on a penalty to win the title 4-2. After 3 years it seems very strange for the journey to be over. As I look back I am very grateful to have been a part of this team and thankful for all the generous love and support I/we received on the way. Don’t know where the 2021 World Cup will be but I’m ready to go! United, Strong, Able, TEAM USA!!! Photo by Scot Goodman. Click here to go to his gallery.